Looking to cut a swath across the gaming landscape this first quarter is Dante’s Inferno. The game has garnered some attention and some controversy from the gaming community. With a demo already released on both Playstation Network and Xbox Live, gamers have been able to get a look for themselves about what this game will really be about. Are we just looking at a God of War clone, or is there something else there for us to experience? Recently, we here at Gamers Platform had an opportunity to sit in on a roundtable interview session with three key members of the development team for Dante’s Inferno: Jonathan Knight- executive producer, Mike Cheng- level designer, and Vincent Napoli- lead combat designer. The last thing on my E3 agenda was to have a little sit down with Bill Roper, Design Director of Cryptic Studio’s upcoming game, Champions Online. He invited us special people to have a nice lunch at the Palm Restaurant while someone demoed the game and he took us through the fundamentals. If you’re unfamiliar with the brand, it goes way back to the pencil game created in 1981, and it takes a lot from it. For instance, customization is a HUGE part of the game, both then and now. What he and the developers wanted to do was to allow gamers to create their very own, unique heroes. For instance, in World of Warcraft, there are a few classes and then some armor you can put on. However, when you get to the highest level, everyone looks the same because they’re wearing the best armor, etc. However, with Champions Online, you can create your own unique look, and keep it that way throughout the game, while still upgrading weapons and things of that nature. Another game shown behind closed doors was The Saboteur from EA and Pandemic. This game is set in the 1930’s, in a Nazi-occupied France. You play as this race-car driving man bent on ridding your country of the Nazis. The story is very lightly based on the Bugatti racing team. Anyways, you become an agent for this underground group and you will slowly rid the Nazis of several areas around the country. The entire world is open and it’s all streaming, so there are no loading screens or separate levels or anything like that. Because it’s open world, like GTA, you can do whatever you want whenever you want, but there are missions to guide you along. Another way to know where you should go, is this feature called “Will to Fight”. With this, areas you have freed from the Nazis are presented in full color, while those that you have not are in black and white, with certain colors highlighted, like the Nazis red armbands, making for a very distinct vibe. One room that I stumbled across while perusing the show floor was one that was showing off an exclusive, 20 minute demo of Mass Effect 2. While this lovely young woman was playing the game, another developer was taking us through the features and what we could expect. The first thing that he got out of the way was the fact that you do play as Sheppard, and he did not really die. However, depending on how you play the game, he could be dead by the end, which will make you want to replay the game if you want to continue playing with Mass Effect 3. Mass Effect is a trilogy, and one that is focused on Sheppard, so if you want to import your Mass Effect 2 game into ME3, Sheppard will have to survive. The story of ME2 has something to do with a disappearance of a number of humans and Sheppard’s goal is to find and rescue them. However, Sheppard cannot do this alone, so he must recruit the best possible members to join his team, and this is a huge deciding factor into whether or not you are successful in the end. Another game that Bethesda was showing off behind closed doors was Wet, which will have you playing as Ruby, a foxy assassin armed with a couple pistols and a sword. The game is going for that 70’s motion picture vibe in art direction, so during cut scenes you’ll see a lot of burns and tears and things of that nature. You could compare it to a Grindhouse or Kill Bill in some aspects. Gameplay wise, the game is focused on gun slinging in slow motion, as you perform crazy-cool acrobatics, taking out enemies left and right. You can jump into the air or dive and have free motion, aiming anywhere around a room that you like, with Ruby tilting or maneuvering how you like, with ease. As you focus on an enemy and begin to fire, the game will automatically go into slow motion, returning to normal after you’ve finished firing. Also, because you have two guns, you can automatically target one enemy, and then aim for another to fire at two. One of the games I got a chance to look at behind closed doors at Bethesda’s booth was Rogue Warriors, coming out quarter four of this year for PS3, Xbox 360, and PC. The story is lightly based on a true story about a commando who went on some missions to help protect America and stop terrorism. The game is a first-person stealth shooter, where it is possible to go in guns blazing, but it’s not recommended. By just running in, numerous reinforcements will be called, so the demoer showed off a lot of stealth tactics. For instance, it is preferable to sneak up behind an enemy and silently kill them via some brutal take down. 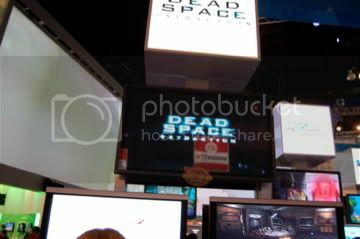 Two on-rail shooters were present on the show floor, Dead Space: Extraction and Resident Evil: Darkside Chronicles, and I would have to say that Extraction offered a lot more with its gameplay. Darkside Chronicles maintained the same gameplay as the previous game, where you could pick up weapons and items and shoot up a bunch of zombies, but Extraction offered a lot more. Extraction features jump-in co-op, but you still play as one character. Like Darkside Chronicles, there are a variety of items you can pick up, as well as open doors and manipulate other objects with the A button. You can pick up weapons, ammo, upgrades, and other things, like journals or video objects that will reveal parts of the story. After getting shafted yesterday in trying to play this title, I got the chance to today. 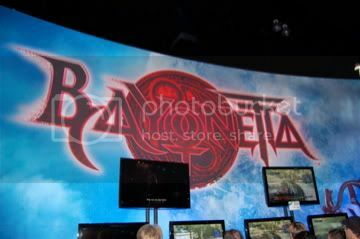 The game is very similar to Devil May Cry, and that’s probably because the original designer worked on this game. You can jump around and attack with ease, able to punch, kick, or fire your guns. You have a couple weapons which you can switch between, and also pick up a heavy weapon that other enemies have dropped, such as huge axes or larger guns.